Gibson feels like the old friend you visit when a night out calls for good conversation. 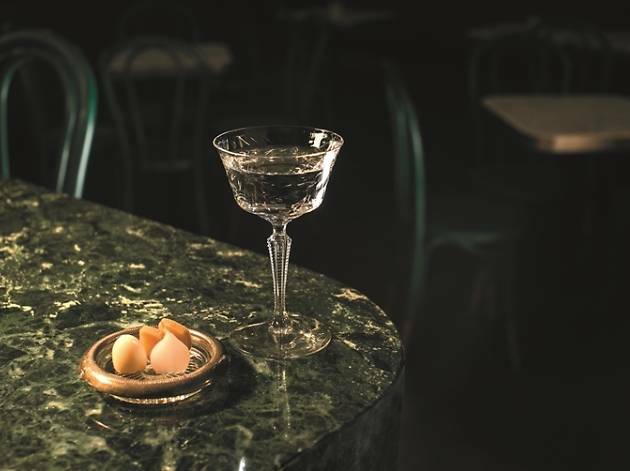 It’s a disarming charm that worms its way into the snacks and cocktails – split into four narratives from classics to the unconventional – to great success. The namesake Gibson ($23) is a boozy Hendrick’s with a touch of Monkey 47’s herbaceous qualities, stirred in with Dolin vermouth. Three bite-sized portions of onion, smoked radish and quail’s egg – all cured in- house – are on skewer to chase each sip with a different nuance of umami. 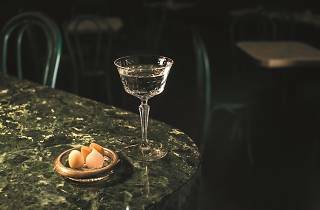 Rye Dynasty’s ($23) clever alchemy turns out a drink whose complexity goes from prickly-sweet to a slow finish of nuttiness. And the Crimson Bullet ($23) holds a mix of tequila, mezcal, kümmel liqueur, lime and – you won’t believe it – beetroot for an earthy drink that plays up mezcal’s smoke and brine. The elevated bar snacks come with hefty price tags. Pick from tiered seafood platters ($120/ single, $220/double), or uni-, caviar-, and lobster-topped Blackmore wagyu carpaccio ($130) and Maine lobster ($42). Not that the more affordable plates can be dismissed. A big bowl of oyster chowder ($22) feels like a fuzzy hug after a few strong ones and the oily ceviche of sea bream ($22) is satisfyingly fatty, with slices topped with vivid fennel shavings, mango and chilli. What Gibson offers is plenty of options to soak in the good vibes. Find your boozy bliss here.